From left, Trey Lockhart, Kelly Smith, Liv Stokes and Lola Fisher. 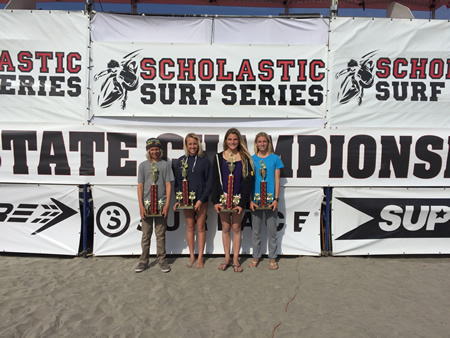 The Thurston Middle School Surf Team took second in the Scholastic Surf Series Middle School State Championships, its best results so far. Thirty middle schools from Santa Cruz to San Diego competed in the contest at Oceanside Harbor on April 18 and 19. Individual results: boys short board, Trey Lockhart, fourth place; girls short board, Kelly Smith, sixth place; girls long board, Liv Stokes, second place and Lola Fisher, sixth place; and body board, Cole Fink, sixth place.